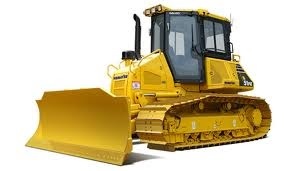 The bulldozer is a frequently used piece of heavy equipment. Commonly known as the bulldozer, the large dozer machine has been around for centuries. These machines have assisted construction workers in breaking ground and moving around large, heavy piles of dirt, metal, rocks and other large masses. Initially used by engineers, construction crews and architects, many companies began producing their own version of the heavy machinery. These companies include: the Caterpillar Tractor Company, John Deere, CAT, Terex, Fiat-Allis, Liebherr, Komatsu, International Harvester and JCB. Previously much louder, larger and much less efficient, the dozer quickly became a necessary piece of equipment used to complete a wide array of earthmoving projects. was originally modified to resemble the Holt farm tractors. By the late 1920’s, the enormous piece of equipment was greatly improved and reintroduced to the construction world by the now global company, Caterpillar Incorporated as the Caterpillar 60. Greatly advancing its technology by the 1940’s, the bulldozer adopted rubber tires enabling it to dig large canals, raise broken dams and move large mounds of earth. As technology continued to advance, so were the capabilities of the dozer. Now, coming fully equipped with automatic transmissions, razor sharp hydraulic cylinders and electric motors, there isn’t much that the powerful dozer can’t do. In addition to these immense improvements to machinery, certain manufacturers like Leica Geosystems, Trimble, Inc. and Topcon Positioning Systems now enable bulldozers with GPS tracking capabilities. Possibly the most important component of the dozer is its blade plate. Made from a thick metal, the blade is used to move things like rocks, sand and different particle masses. Depending on the type of bulldozer, there are three different blade shapes; the ‘S’ blade, ‘U’ blade and a combination of both the ‘S’ and ‘U’ blades. The most common blade, the ‘S’ blade, is a relatively straight, short edge that has no arch and no side attachments. Another blade type that is somewhat common on new age dozers is the Universal blade or ‘U’ blade. With an all-together different shape than the Straight blade ‘S’ blade this type is tall and extremely curved. Developed with large side wings, the Universal blade is used to move larger mounds of material. Finally, the most common blade option is the ‘S-U’ combo. Generally smaller than the other two blades, the ‘S-U’ combination has smaller side divisions that are used to push large piles of debris. Regardless of the blade that is being used, the bulldozer part typically attaches to the frame of the piece of machinery either straight across or at a slight angle. For more advanced attachment options, some blades require an extra ‘tilt cylinder’ to provide more of a curve. Interestingly, the bulldozer’s blade can actually be sharpened using a special sharpener that allows various objects to be cut down like tree stumps. When deciding on the appropriate part to use, it’s extremely important to know what the piece of equipment is being used for.